The language we use to talk about cities charts a map of our urban world-views. Defensive cities became Mercantile cities which then became Industrial cities, described by Dickens and depicted by Dore’ as smoggy and blight-ridden, invoking thinkers like Ebenezar Howard to envision Garden cities. In the late 20th century, as heavy industry left cities people began to rediscover the joys of urban living, new terms emerged: Jane Jacobs’ Open City, Richard Sennet’s Democratic City, Saskia Sassen’s Global City described concentrations of capital and power, World City described cities with strong global identity, and Mega City was used to describe growing global metropoles. In the early 1980s I began to write about “Ecological Cities” inspired by the writings of Paolo Soleri and Buckminster Fuller. My research on urban models in the American Southwest looked at how different world views expressed themselves in different periods—the Anasazi/Pueblo settlements, late-industrial sprawl of Phoenix, and Soleri’s Arcosanti experiment. Some were clearly more sensitive to the harsh natural environment than others. 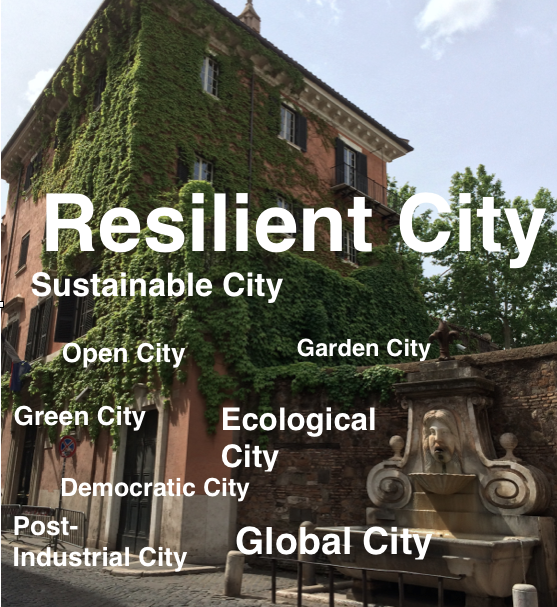 Over the past two days I have been participating in workshops organized around a relatively new urban expression: “Resilient Cities”. Resilience is clearly understood as “the capacity of individuals, communities, institutions, businesses and systems within a city to survive, adapt, and grow no matter what kinds of chronic stresses and acute shocks they experience.” Bryna Lipper of the Rockefeller Foundation, in her introductory talk, called Rome the “Quintessential resilient city” given that it has been bouncing back from decline for over two thousand years. Rome has known when to shrink (decrescita’ was a medieval concept) and when to retool. For this reason Peter Madonia, Chief Operating Officer of the Rockefeller Foundation told me they consider New York and Rome the two key cities in the project, inspirations to the rest of the world. 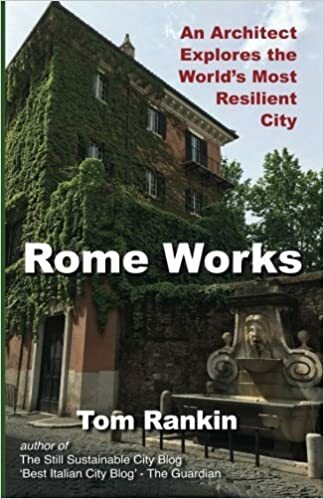 Put differently, if Rome (with nearly 3 millennia of experience) can’t meet the resiliency challenge how can we expect emerging cities in the developing world to do so? The second reason Rome was chosen as one of the 100RC was for the particular challenges the city faces (the reason I stay in Rome despite all the frustrations). The third was a perceived openness to collaboration on the part of the city administration, especially in the person of the Commissioner of Urban Transformation Giovanni Caudo. Mayor Marino surprisingly wasn’t present at all during the events, although his name was in the program and he attended, with Caudo, a private dinner hosted by American Ambassador John Phillips and Linda Douglass for the Rockefeller Foundation. In two days of well-organized workshops the 100 invited experts were divided into teams to brainstorm about Rome’s key “acute shocks” and “chronic stresses” and later to discuss Rome’s performance in various categories from Leadership to Well-being to Infrastructure to Security. 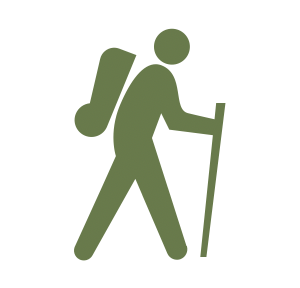 (the results were predictably negative, although some attempt was made to recognize that, despite the miserable conditions, the climate is good and the food is great and we live well in Rome!). Emerging from the first discussion was an overwhelming concern that city processes be participatory, empowering stakeholders to resolve problems directly. And that access to data, and the public administration’s accountability (esigibilità) are both key. The major shocks, apart from the frequent huge EVENTS which strike the city with regularity (strikes, Papal celebrations, cultural happenings, etc.) were related to climate change (rising waters, flash floods, heat waves, etc.). The chronic stresses we summed up with the term “systemic fatigue”, the day-to-day difficulty we all face in Rome in carrying out the most based functions such as taking a child to school or paying a bill. On day two specific groups were formed, I joined on discussing cultural heritage and one discussing big data. In both cases, it became clear that there is is plethora of “actors” and projects but a dearth of coordination and communication. There is so much energy and knowledge striving to emerge in this city, but so often buried in arcane communications protocols and obstructed by arcane bureaucratic procedures which no one likes but no one takes the initiative to remove. The next steps for the Resilient Cities project should be clear: the city will draft (has drafted?) a job description for the Chief Resiliency Officer to be chosen (by when?) by the Mayor. The participants invited to the Agenda Setting Workshop will continue (in what form?) as the working group and communicate ongoing ideas and observations (using what platform?). Giovanni Caudo confessed that the city’s website doesn’t lend itself well to participation, but perhaps a Facebook group or simply a hashtag on Twitter would work to keep the conversation going. #100RSRoma ? Or just comment here. The current situation of chaotic crowding in the streets of Rome must be remedied by making drastic changes in the use of PUBLIC SPACE. Three issues and their handling in brief (to be developed later). 1. Large delivery vans: OUT BY EIGHT. All large vans must be outside the Centro Storico by 8 am (ancient Roman precedent for this). 2. Restaurants and Bars: OUTSIDE = INSIDE. The seating area occupying exterior public space must not exceed the interior seating area of the restaurant or bar. 3. Tour groups: 25:1. Maximum ratio of tour members to tour leader. I think you have my two exhibition catalogs, Roma Ingombrata and Roma Cancellata, which precede the above. As for the “Chief Resiliency Officer,” clearly if it is not the Mayor himself, nothing much is likely to get done. thanks Allan, for your words of wisdom. Hope that they get maximum visibility! Regarding delivery vans, I’d love to see reserved delivery zones enforced and all pedestrian zones closed also to delivery vans–handcarts work just fine. Roma is indeed a really great city. Since writing this, I haven’t heard much about 100RS Rome. Does anyone know what happened to the project?